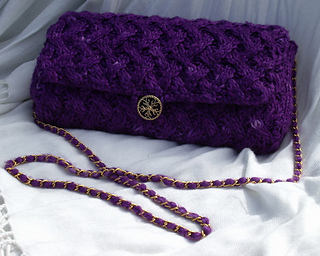 This little evening bag was inspired by the classic Chanel bag that has seen so many incarnations in anything from pastel leather to ostrich skin, so why not a knitted version? The lattice work cable pattern mimics the quilted look of the original bag and the pure silk yarn makes this a pleasure to knit. There is an error in the cable pattern see below for the corrected version. Row 1: P1, (P2 CB4F), repeat to last st P1. Row 2: K1,(P4, K2) repeat to last st, K1. Row 3: P1, (T4B, K2), repeat to last st P1. Row 4: K1, P2, (K2, P4,) repeat to last 5 st,K2, P2, K1. Row 5: P1, K2, P2,(CB4B, P2,), repeat to last 3 st K2, P1. Row 6: K1, P2, (K2, P4) repeat to last 5 st K2, P2, K1. Row 7: P1 ( T4F, K2), repeat to last st, P1. the T4B should read like this: “Slip the next two st onto a cable needle and hold them to the back of the work, K2 st from the main needle, slip the two st from the cable needle back onto the L hand needle and purl them.